Last week I visited Kraków for the second ACE! 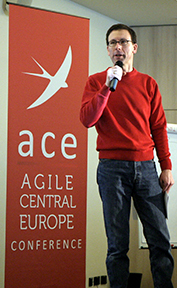 conference 2011 – Agile Central Europe, organised by Paul Klipp. To set the record straight up front – it was an excellent event. The intense, fun packed two days started with a keynote from Corey Haines who reminded us of the central role that feedback plays in agile and the importance of many technical practices. There were sixteen 30 minute sessions in only one track. This was a change from the previous year, and although I have not had a chance to compare, for me this format worked well. We had an opportunity to be exposed to a diversity of topics and each session was concise and punchy. My personal favourite was “Overcoming Self-organization Blocks” by Andrea Provaglio delivered in a direct and engaging style and addressing an interesting and important subject of self-organisation and personal dynamics in agile teams. Paweł Brodziński had a really clever idea to run his presentation about Kanban using a real Kanban board, it worked very well. Marc Löffler tackled the problem of meaningless RAG reporting using melons – very tasty. Monika Koniczny did a great job running bubbling experiments on stage, talking about games and turning me into a creative person in front of everyone. Presentations from Elad Amit and Barry O’Reilly both provided valuable food for thoughts for me. I also hope the message from Mateusz Srebrny was picked up well as he was talking about an important topic of visual management. All sessions were videoed and should be available on-line soon. I will follow-up with a post with a pointer to my talk. In between the talks, there were openspace sessions facilitated effectively by the mischief maker Mike Sutton. This was a perfect opportunity to engage with the audience and learn from each other. I lead two sessions – first one on “Motivation” based on the ideas from Dan Pink’s book “Drive” and another one as a follow-up from my talk and discussion of challenges agile faces in large organisations. Both gave me interesting insights into some cultural aspects of agile adoptions in Poland. I also joined the first Polish ALE Network panel with Marcin Niebudek and a session on retrospectives with Nick Oostvogel. The latter brought an important insights from Maria Diaconu about the importance of gathering data for improvements during the sprints as well as in retrospectives. There was also an opportunity, at the end of each day, to give a 5 minute lightning talks on any subject and once again, it was a good place to hear others’ ideas. I’ve managed to sneak my two pence in on “learning from mistakes” (inspired by Kevlin Henney). The conference was really well organised and went like clockwork with Paul doing a great job of keeping us all on schedule. In the true agile spirit there was also a feedback flip chart and many suggestions written down were acted upon very quickly. I’d like to call the ACE!2011 the right size conference: the timing was right, the presentations worked well with the 30 minutes format, the size of the audience was good and the size of the presenting crew fit well. The event was closed in an excellent keynote by Jurgen Appelo (serendipitously available at an almost last-minute this Dutch guy simply rocks) and was by far my favourite of Jurgen’s talks that I’ve seen. He paid great attention to what was going on during the two days and managed to weave several quotes from other speakers into his talk so it felt like a truly engaging dialogue with other speakers and the audience rather than just a simple recital. (Also, no Germans were hurt while he was running the show). The closing keynote proved that in the short space of time, with the help of the particular conference format and thanks to great people, we have managed to engage fully and bond well. It was great to put some real faces to twitter friends and to make new friends. Somehow only, I’ve missed Szymon, next time perhaps. I’m already looking forward to visiting Kraków next year and so should you, it will be awesome. The rumour has it Lisa Crispin might be joining us for the keynote… (no idea who started that one).